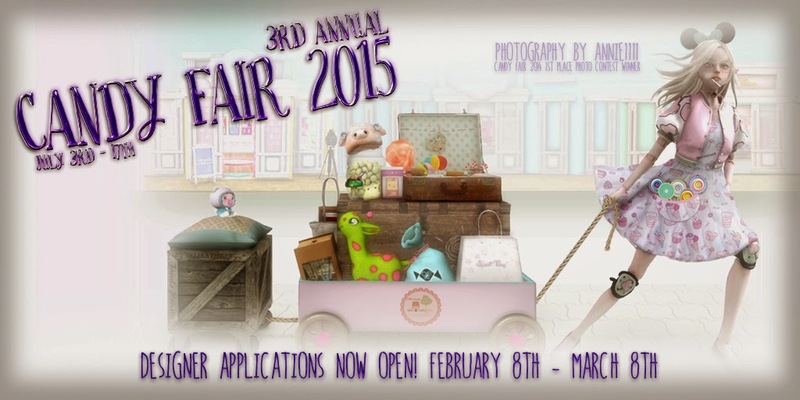 Candy Fair 2015 Designer Applications Now Open! Designer Applications are now open! The fair this year will be from July 3rd - July 17th. This year the fair will span across just one sim with the inspired theme of Willy Wonka and The Chocolate Factory! Come join us in bringing the chocolate factory alive with all the candy and treats! Designer applications are now open through March 8th, 2015! Acceptances will go out March 22nd. This year we will only be accepting no more than 80 stores, unlike the large number of stores we had before (usually over 100). Please understand we can not accept all stores and take a very long time to decide on the stores we choose. None the less we hope you will all come enjoy Candy Fair 2015 with us! Thanks so much for your continued support over the years!